Why should the two even be part of the same discussion? Football is just a game, and politics is well - politics. Just keep the two apart from each other, and things should be fine. As it turns out, things aren't quite simple in the real world. Especially in a tournament where the men on the field are representing the flags that are unfurled above them. The most recent case of politics finding its way into football is the Switzerland match against Serbia in Group E of the 2018 World Cup. 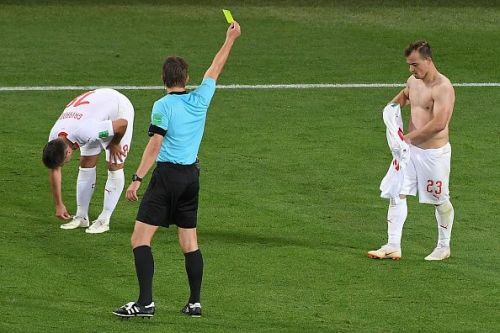 Switzerland's Xherdan Shaqiri and Granit Xhaka found themselves in the news for both the right and wrong reasons come the end of the match. Switzerland won, thanks to goals from the pair but the tabloids were more focused on their celebrations. What does look like a bird - many assumed it was a dove as a sign of peace - but it couldn't have been farther from the truth. It is in fact the Albanian eagle. And the celebration was as political as they come. Why Albanian? For that, we need to go back as far as 1998. 1998 witnessed the Kosovo war - fought between the armies of Yugoslavia (the combined republics of Serbia and Montenegro) and the Kosovo Liberation army, which comprised of primarily Albanian ethnics that sought the independence of Kosovo from the state. The war ended with massive losses on both sides, both property, military personnel and more importantly, civilian personnel. For the Kosovo community, it meant something even worse - displacement from their mother land. According to official reports, over 1 million Kosovo settled Albanians had to flee Kosovo and seek asylum in other European countries. As with all wars, it never came to an end. Ethnic violence returned several years later, and is still a cause for major unrest in the region. Stoke City’s Shaqiri was born in Kosovo and the Arsenal midfielder Xhaka was born to Albanian parents who were from Kosovo. 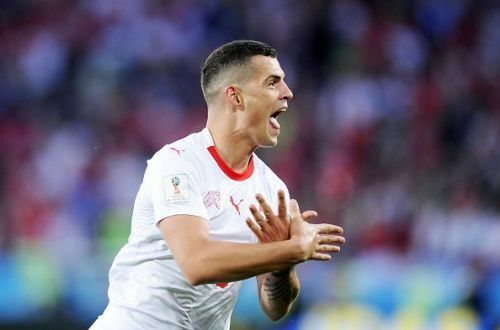 Xhaka’s father was a political prisoner following the 1986 student demonstrations in Yugoslavia against the communist government in Belgrade. Xhaka’s brother Taulant plays for Albania’s national side. And when they played against Serbia, tensions were unusually high, and when they scored, it is more than understandable that they did what they did. For those of us who have not experienced anything close to that, it might come off as an unnecessary political statement. But is it really unnecessary? Because sports and politics have often clashed in the past, and political leaders have often used sports meets as platforms for their ideologies. Hitler used the Berlin Olympics as platform for his pro-Aryan beliefs. 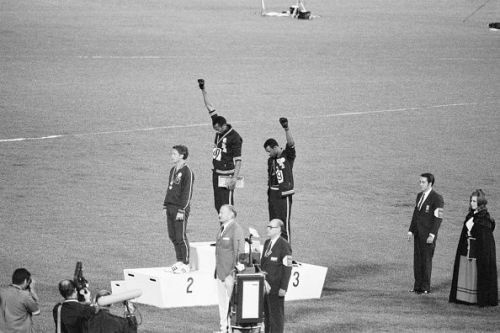 Tommie Smith and John Carlos used the 1968 Olympics to bring about the infamous "Black Power salute". Since we are there, you might be tempted to ask - "If ideologies can be flaunted, would a Nazi salute from a player be tolerated as well?" Therein lies the problem. That is where basic humanity comes into the equation. 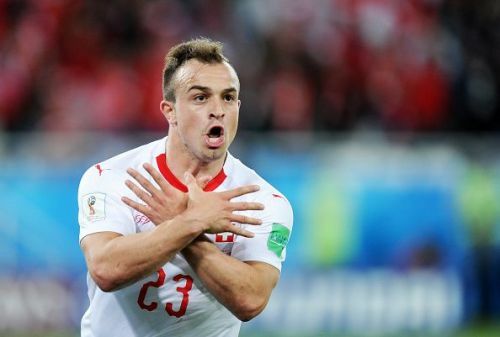 What Shaqiri and Xhaka (as well as their captain Lichtsteiner - who had no reason to do it but to show his solidarity with his beloved teammates) did was not a showcasing of their beliefs, but raise an awareness of the facts. They did not show their support of a blood-stained tyrant, but the people who were oppressed by it. Their motive was not to rile up the Serbians around the world (although that is a collateral damage) but to show the world that they remembered. Recently, Mohamed Salah hit the news for being given the honorary citizenship of Chechenya by Ramzan Kadryrov. For those unaware, Kadyrov is the leader of the Chechen republic, and faces reports of gross human violence and particularly against homosexuals. Unhappy with his involuntary involvement in this political scenario, Salah is reportedly angry with his national side and might even consider an early retirement if that is what it takes. While it might not happen, it shines a light on the inter-dependency of these two issues. Footballers, whether they like it or not, are recognised around the world. In some cases, like Mata's charity program, it makes them the perfect spokesmen for a good cause. In some cases, it makes them the right people to bring an issue into the light. And in cases like Salah, it makes them easy to exploit. Were the Swiss trio right in doing what they did? Ask Serbians, and they will tell you no. Ask Albanians, and they will tell you yes. FIFA has not given them bans after rescinding the appeals from the Serbian FA asking for them to be banned. The truth is, the answer to that question is not binary. It is highly opinionated, and not something you argue with facts. But one thing is for certain - it will not stop. There is a very fine line between the world of football and the politics that goes behind it, and it is a line that will often be overstepped. What are your thoughts on the politically themed celebrations by the Swiss? Have your say in the comments.